I feel like I say “This is my favorite soup!” way too often. Of course, they can’t all be my favorites. That said, cauliflower soup really is a true favorite. This shouldn’t surprise you, given the unabashed affection I showed for roasted cauliflower, smashed cauliflower, Mexican cauliflower, and a few of its friends like aloo gobi and tri-color cauli salad. Today’s soup is simple to prepare, and it begins with roasted cauliflower. Now, if you’ve made cauliflower soup before, you might be familiar with the most common preparation, which basically boils the crap out of cauliflower along with the stock and onions, purées it up, and there you have it. Easy as pie. I made the soup this way for years following this method, and it’s solid. 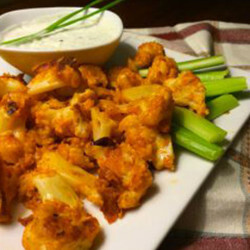 The idea for starting with roasted actually came from having leftover roasted cauliflower. 1. Roast the cauliflower, as discussed here. Else begin with note 2. 2. Sauté chopped onions and celery in olive oil in a medium hot pan about 5-7 minutes, until soft; season with salt, black pepper, and thyme (fresh if you have it, else dried). Add several cloves of crushed garlic and stir until fragrant ~45 seconds. Add vegetable stock and roasted cauliflower (or raw if not using roasted). 3. Stir, bring up to a boil, then simmer ~15-20 minutes, until cauliflower is completely cooked and soft. 4. Purée soup. For a homogeneous soup, purée until smooth. For a more rustic soup, remove some of the cauliflower pieces before puréeing and add back at the end. For a thinner soup, add more stock. If desired, a bit of cream creates a velvety consistency that I like. A few tablespoons is all that is needed (or you can use more), as the soup is already beautifully thick, but a touch of cream is really lovely. Taste it before you add cream so you can decide what you prefer; it’s certainly not necessary if you prefer a vegan version. 5. Finish seasoning with a grind or two of fresh nutmeg and additional salt and black pepper. Additional seasonings I add that really make a difference are dry mustard and white pepper. 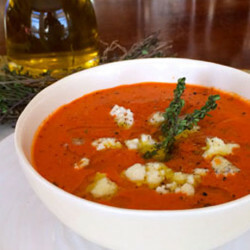 Note that the flavor of this soup will vary depending on what stock you used and whether or not you roasted the cauliflower, so you may need to futz with the seasonings: the more flavors you started with, the less you’ll need to add at this step. So let me just summarize that if you are new to cooking and/or have limited time or desire to roast the cauliflower, I’d still highly recommend this soup. 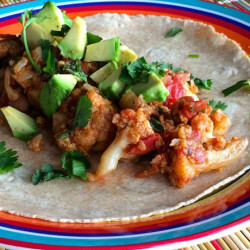 It’s delicious and satisfying either way: I made it using just raw, boiled cauliflower for years (or occasionally today when I’m in a time pinch) and it was still one of my favorites. But when it comes to getting the most flavor out of your veggies, you really just can’t beat roasting. And if you begin with your own stock, too? And then dress it up all pretty so it’s truly dinner-party worthy? Yeah, baby. That’s what I’m talking about. If you like this, you’ll love my variations of this recipe made with broccoli, artichokes and leeks, spring peas, pesto and parmigiana, or parsnips.